2. it was more of an impulsive decision to be a part of 'THE GREAT WALL OF MUMBAI’ project... the moment i read about this event on facebook, i so wanted to be part of it no matter what. Fortunately for me, Mr.Tauntas (another important friend in my life, am very much in awe of!) as expected was also attending it.. i offered to help him out with whatever he would decide to paint on the wall that day...n bingo! i joined him on 15th of Aug'09 early morning at Mahim end…we began painting 3 of our chosen walls with 3 of his different concepts in mind. The air was vibrant! everyone present there was vibrant…oh you bet i felt like a kid there with so many colours, brushes, ideas, creative people n a HUGE n WIDE dream canvas around! it rained as well for that added thrill in the middle of it all! All of us were there to literally paint the town red on the eve of India’s Independence day..i cant even do enough justice to express how i or others might have felt…it’s not like i’ve never been part of voluntary community service or projects before, nevertheless every time you do something for your people, city, country, it only makes you feel more humble, giving you a sense of pride, worth, for being useful in your own way without really asking for any credit! Right from the BMC boys (part of their temp. contract staff – i must say these so called ‘uneducated-lower middleclass’ youth were more raring to go with their support and suggestions while helping us! God bless them! :), BMC employees, the participants of the project (ranging from established professional artists, art students, amateurs, families, non-artists like me, people from different walks of life, the locals, neighbourhood kids, etc) to the BMC authorities, event organizers, media personnel, etc., were extremely enthusiastic and positive about it! It has to be one of the best independence days i could have ever celebrated! And i can’t really thank enough the organizers n, BMC (for this wonderful joint initiative) and rest of the participants (for their support, coordination, understanding)! All the paintings over 2 days on the wall were so awe-inspiring! Everyone had expressed themselves and how! There was so much to read between the lines! Chanderi (approx. 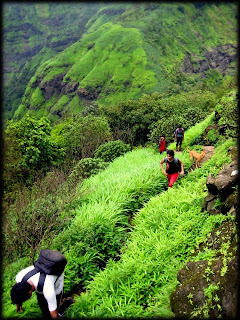 2300 ft. above sea level, Raigad district) famous for its massive pinnacle (apparently it is 300 feet higher than the cave), is one of the most beautiful, fascinating places to trek in Sahyadris! it happens to be a long trail with a great combination of waterfalls (in monsoon of course) and a dense forest. there was a huge cloud cover on both the sides and it was quite windy that day (though not as strong it usually is on top). We’d to traverse along the right side of the base of the pinnacle wall & reach the cave (this entire uphill climb took us about 4 hours). On the way to the cave, there is a water tank on the left side which holds potable water. The cave houses a 'shiva-ling' and is spacious enough to accommodate about 20 or more people for an overnight stay. The pinnacle is huge and only the experts can dare to climb it! Within 5-10 minutes after i made it to the top, the clouds cleared and offered such a fantastic view from the top that i completely forgot i was to hurry up with the lunch and start with the descent soon after - lest it gets dark by the time we reach the base! We started climbing down immediately afterwards and made it to the base in couple of hours. Overall an amazing experience for me though few members of our group found it tough n missed out on reaching the top!!! and now I am all happy happy and set for another trek this weekend to my all-time favourite destination ‘Matheran’! yippeee!